The title is “Are blood sugar parasites damaging your blood sugar”. There is so much wrong with that sentence. You eat food and your body converts the carbohydrates and other components into blood sugar which is used in your muscles as energy. The concept of “blood sugar parasites” makes no sense. Parasites are living organisms – tiny creatures that infect your body – nothing to do with blood sugar. “parasites damaging your blood sugar”. This makes no sense. You cannot damage blood sugar. Your body constantly makes blood sugar from your food. The email is actually about a cure for diabetes, but the scammer got carried away with poetic notions that are just complete rubbish. The magic cure for diabetes in this case is supposedly a cooking oil. That is nothing to do with how your body manages its blood sugar level. 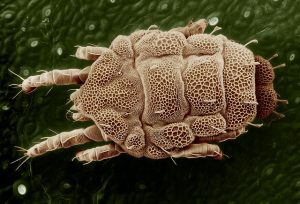 (The picture is of a dust mite – not the non-existent blood sugar parasites).